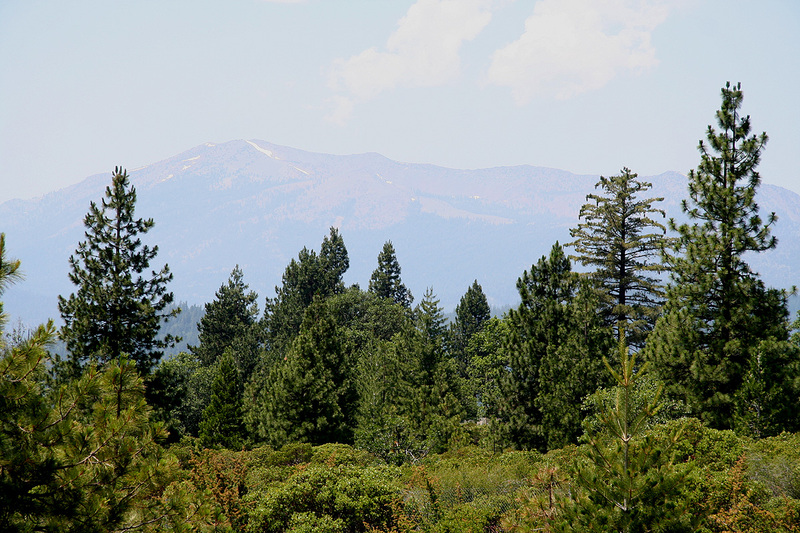 How to get there: Drive Interstate I-5 north towards Mount Shasta, after the place named Shasta you arrive at Weed. Continue north of Weed (just a very short stretch), then locate Exit 751, Edgewood/Gazelle and exit here. Turn left (under the freeway) towards Gazelle, then right at the first stop sign on the other side. Measure from here. After about 0.5 miles, make a left at the first road that runs left. This road has a sign that reads Stewart Springs Rd. At 4.5 miles, make a right on Forest road number 17. At mile 13.6 (approx. 22 kilometer), you are at the clear saddle. There is parking on the left. Park here, this is the trailhead. Location N41:20.578, W122:32.264, elevation 2080 meter. This road is quite nice and paved all the way. It may be closed by snow earlier in the season. The driving distance from San Francisco is pretty close to 300 miles or 480 kilometer. Route description: The trail starts out from the parking area to the far right if you face the ridge (that is your back is towards the road). Do not cross the road. Do not hike the forest road, but follow the (very) nice trail that contours around on the right hand side. This trail traverses the hill and stays pretty much level as it makes its way to a valley further away. At one point the trail crosses a forest road (that runs downhill). Continue along the trail. 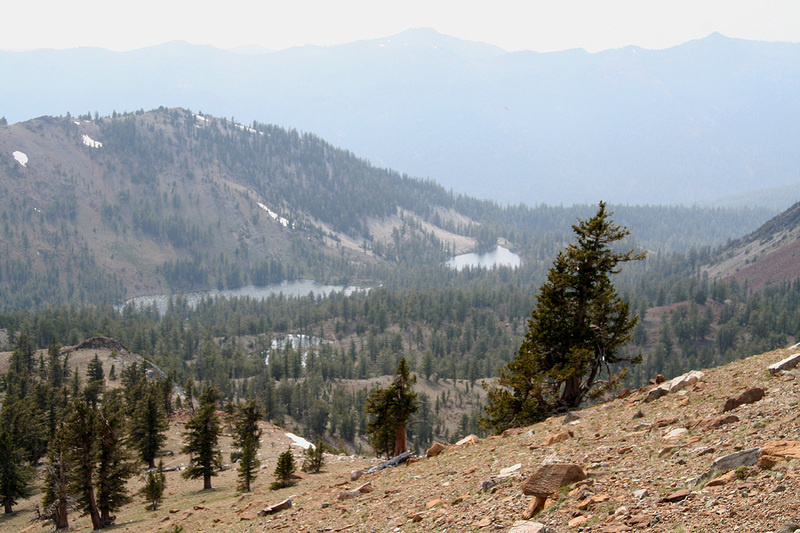 After a while, the trail enters a pretty distinct valley and crosses a small creek. You are now near the biggest lake in this area. 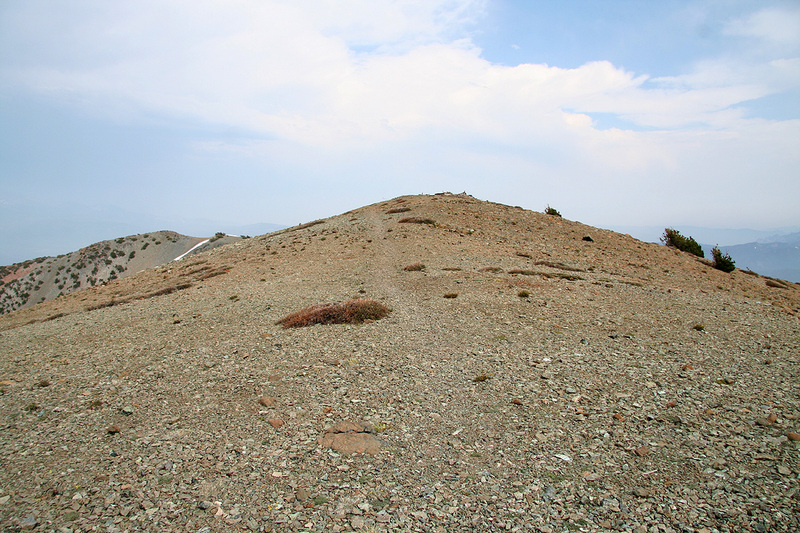 The trail forks, the summit trail is the leftmost fork. Going straight ahead gets you to the lake. Just about 20 meter above the lake, you are at location N41:19.130, W122:30.204. 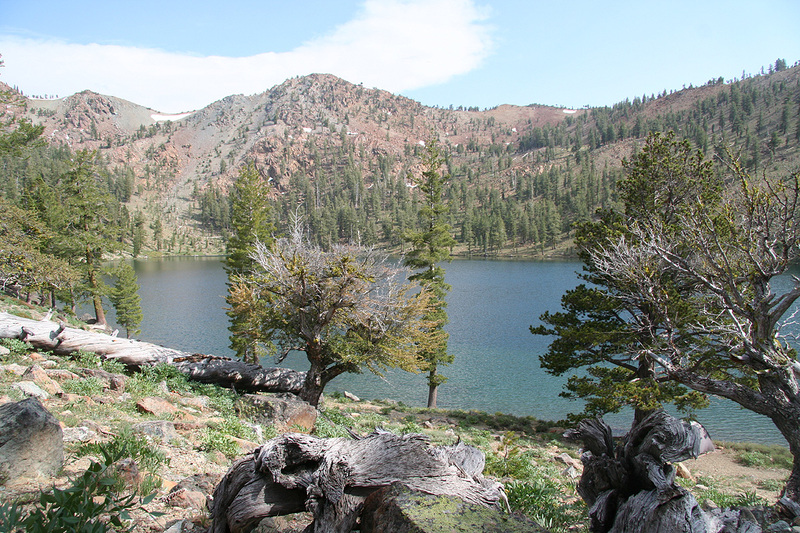 The lake has elevation around 2200 meter. 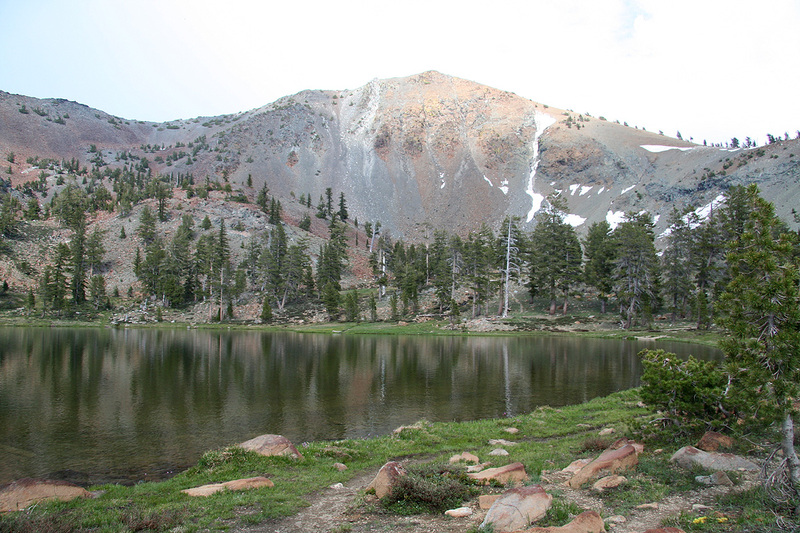 Follow the summit trail as it now starts going more uphill.You will pass a small pond, then a small lake, before the trail turns right and ascends to a saddle that separates this valley from other terrain. Mount Eddy is straight uphill to your left. The trail now zig-zags up the slope and reaches the summit near a few old ruins. 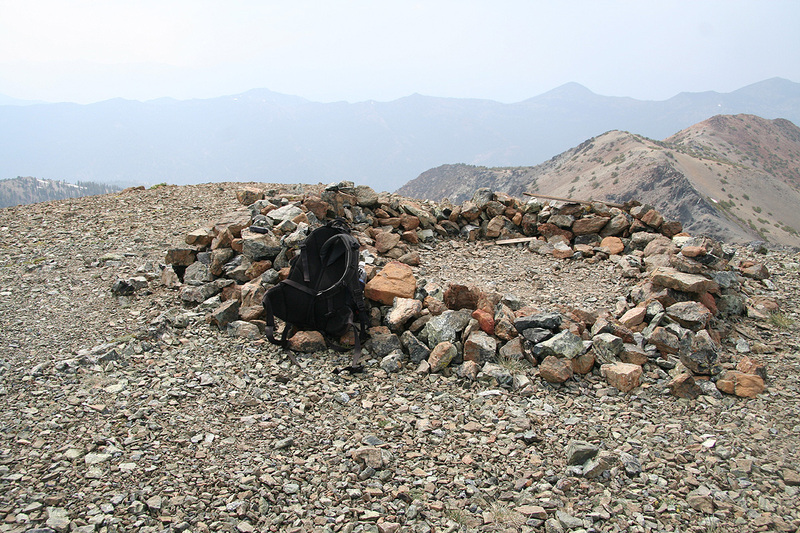 The summit cairn is about 50 more meter along the summit ridge to your left. The two points are pretty close in elevation, my GPS recorded 2756 meter for both points. Comments: I hiked this mountain solo. It was my Ultra mountain number 100. I had an unusually long day and a correspondingly long travel on this Saturday, in order to climb Mount Eddy. My day started in the Chinese city of Suzhou, about one hour west of Shanghai. I had breakfast with my wife Heidi at 0700, followed by a 2 hour car ride along Chinese (super) freeways to the Shanghai International Airport. Heidi would fly to Frankfurt, then Bergen, while I would fly to San Francisco. We will meet in 12 days in San Diego. The flight was a bit bumpy, with a tail wind exceeding 200 km/h that made me get into SFO shortly before 0800, still on Saturday, June 28. My rental car was waiting and I arrived at the trailhead shortly after 1400. Gear needed to be sorted out and I was on my way along a very nice trail at 1425. I arrived at the lower (biggest) lake after 45 minutes of brisk walking. The weather looked like it could erupt into a major thunder/lightning show any minute. Another 50 minutes brought me to the summit and the weather had not gotten any worse. Mount Shasta was completely hidden from view, clouds all around. I recorded the GPS location and took a couple of photos, then returned to lower (and safer) ground. I made a couple of short breaks on my retun hike, including a visit to the (largest) lower lake. I returned to the car at 1745, 1:35 back down was the same as my ascent time. The plan was now to drive back to SFO, since I had a flight around 0830 the next morning to Salt Lake City. However, as I approached Williams (a small place in the Central Valley along Interstate I-5), my brain said: "Dinner and Sleep - Now ! ", this seemed quite reasonable. I quickly came to the conclusion that it would be safer (and better) to sleep now, then make an early start tomorrow in order to catch my flight. I am travelling on an "around the world ticket" and it required three stops, otherwise I would have proceeded directly to Salt Lake City. To read about the other peaks climbed on this trip, see this summary. Mount Eddy, as seen from Interstate I-5. 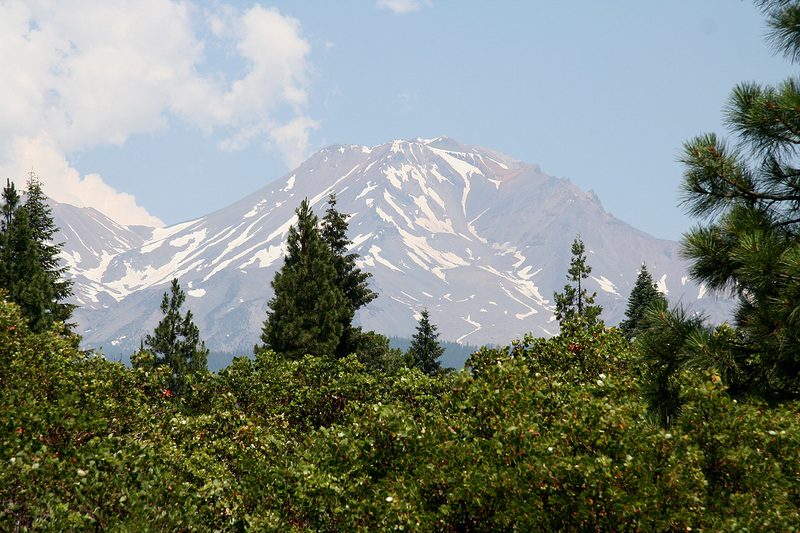 Mount Shasta, as seen from the same spot. 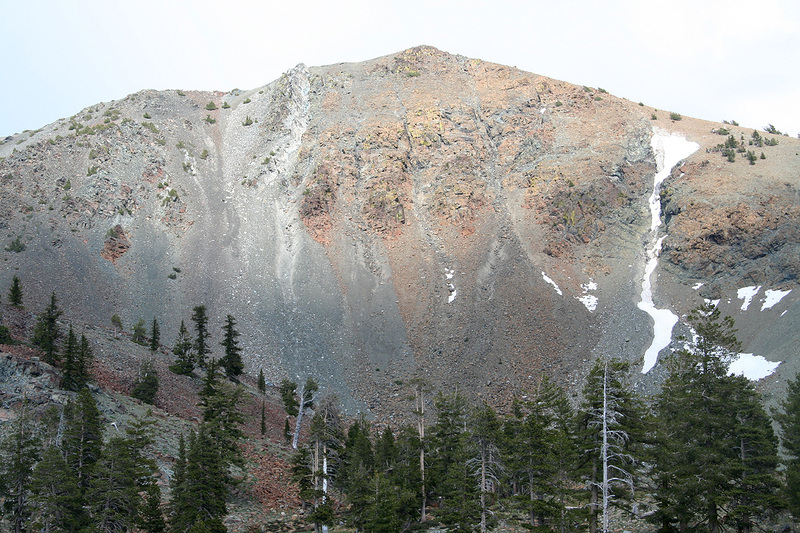 Mount Eddy, as seen while ascending. The valley with lakes, the route comes up here.